Telehandlers, or telescopic handlers, are versatile lifting equipment that you can fit with many different attachments. JCB is one of the top manufacturers of construction equipment in the world. Chicago Industrial, a leading source for top-quality material handling equipment, carries both new and used JCB telehandlers for sale in the Chicago area, throughout the United States and to locations around the globe. When you’re looking for a lift truck that offers the right combination of durability, versatility and low cost of ownership, a JCB telehandler answers the call. JCB was a driving force behind developing the concept of the telescopic handler, and the quality and innovation in the machines it produces is still evident today. From impressive power and productivity to lower fuel consumption and easy maintenance and serviceability, a JBC telehandler can positively impact your bottom line. Our inventory of new and used JCB telehandlers typically contains a wide variety of models to choose from. With maximum lift capacities from 5,500 to 16,000 pounds, lift heights from 20 to 56 feet and ratings from 74hp to 109hp, you’re sure to find a model that meets your unique requirements. Additional features of JCB telehandlers include EcoMAX engines, exceptional maneuverability and multiple steer modes for operator comfort and productivity. Our sprawling Rockdale, IL facility features more than 75,000 square feet of material handling equipment on display. 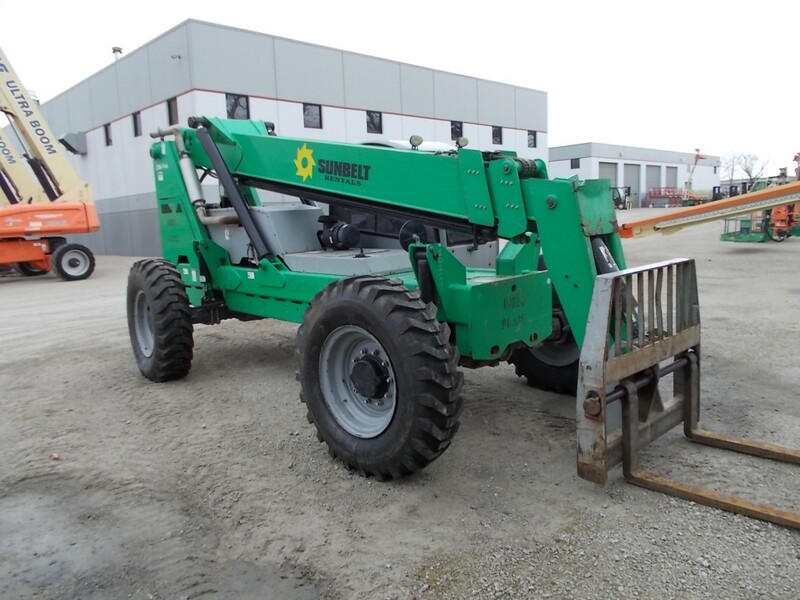 At any given time, we have over 500 different makes and models of lift trucks for sale — including one of the best selections of competitively priced used JCB telehandlers. Simply browse our inventory to see what we have in stock or give us a call at 815-744-8811 to find the specific models you’re looking for. We provide peace of mind in the pre-owned market by ensuring the quality and performance of the used JCB telehandlers we have for sale. Our experienced technicians completely restore all of our used material handling equipment in our on-site reconditioning shop. You get the reliable equipment you require at an economical price to fit virtually any budget. We serve businesses in the Chicago area, throughout Illinois and areas beyond. We’ll ship our used JCB telehandlers coast-to-coast, across North America and around the world. Pick out the equipment you need and get in touch with one of our helpful representatives for a free quote. Not sure if you can afford to buy a new or used lift truck? Our affiliation with the nationwide lender, Direct Capital, allows us to arrange flexible and affordable financing. Just apply online and receive our answer on financing in less than a day. Browse our current online inventory and give us a call if you don’t see the lift trucks you’re looking for. We’ll help you find a solution that represents a cost-efficient and effective fit for your business.